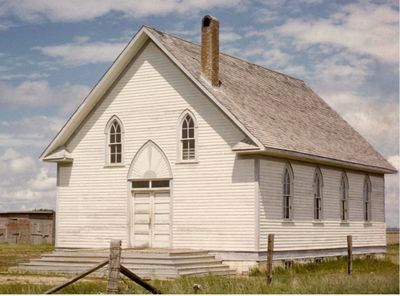 Gnadenau Mennonite Brethren Church in Flowing Well, Saskatchewan began services in 1907, and formally organized in 1910. The first building was occupied in 1913. John F. Harms is considered the founding leader of the group. The congregation originated through immigration from the United States. Leaders prior to 1950 included S.L. Hodel, Isaac Toews, John E. Priebe and William Buller. The congregation merged with Elim Mennonite Brethren Church at Hodgeville in 1968. Mennonite Brethren Herald (27 May 1988): 63. Regehr, Jacob I. and Marlene Epp. "Gnadenau Mennonite Brethren Church (Flowing Well, Saskatchewan, Canada)." Global Anabaptist Mennonite Encyclopedia Online. August 1986. Web. 19 Apr 2019. http://gameo.org/index.php?title=Gnadenau_Mennonite_Brethren_Church_(Flowing_Well,_Saskatchewan,_Canada)&oldid=163415. Regehr, Jacob I. and Marlene Epp. (August 1986). Gnadenau Mennonite Brethren Church (Flowing Well, Saskatchewan, Canada). Global Anabaptist Mennonite Encyclopedia Online. Retrieved 19 April 2019, from http://gameo.org/index.php?title=Gnadenau_Mennonite_Brethren_Church_(Flowing_Well,_Saskatchewan,_Canada)&oldid=163415. This page was last modified on 9 March 2019, at 01:58.